Hey Rick! We are so excited to chat with you and pick your brain. The RRS Sponsored Interviews are called Raw & Unedited because anything goes, and we really want you to be as candid as you feel comfortable with. So, let’s get started. You are a successful photographer, writer, speaker and instructor. But where did it all begin for you and how did you get started? Well, basically it all began in my parents basement in the 1960s developing black and white film in the darkroom – my mother would hand color them. I was around photography from a very young age and, although my father wasn’t a professional, he loved photography and loved taking pictures. I started doing it myself and I thought it was magic. I still think that today. There has never been a more exciting time for people to be photographers because there is so much we can do. When did you make the shift into becoming a pro? I did not make it until I was 40 because after high school I had a couple of jobs, and then I went to Berklee College of Music in Boston studying arranging of composition in Jazz. When I got out of there I was teaching music. In my down time I started sending pictures to magazines because I thought it would be fun to be published. The first picture I sent did indeed get published. They then asked me to write an article, and following that (with no experience) they asked me to be editor of the magazine, which was Studio Photography Magazine. I did that for three years, and with zero experience, Minolta’s advertising agency called me up and wanted me to be the Vice President & Group Supervisor of that account. So I started doing that in 1980 for 10 years. However, from being in that business, I knew that I wanted to be like the photographers we were representing, so I started making a plan. I have been doing this now full time for 26 years and I have never been more excited, energetic or enthusiastic about life, photography and music than ever. So, you are an artist at heart! Well, thank you! I hope so. I still play music every day (guitar and keyboards). I think it’s all related. So many photographers are musicians, Tiffany. Ansel Adams was a pianist and so many of my friends are very talented musicians. I think if you are good at one thing, you are probably good at something else. How have you seen the photography industry change and evolve since you started in the 1970s? It’s still about capturing the image. Of course, technology has changed but it is the same basic concept. Every picture we take has one main element, which is light. When you break that down, the sub elements are shadows and highlights. The basic concept hasn’t changed. I have a new book out called Creative Visualization for Photographers. It’s all about visualizing the end result. Things have changed technologically, and the business has also changed because everyone is a photographer. Back then you could name the top 5 photographers in the United States. Today, there is a million great photographers. There might be a million photographers out there, but that number is greatly reduced when it comes down to great photographers who know how to write. So, writing is the key to being successful today. Another thing I think is really important about setting yourself apart is learning to become a great public speaker. This is so important. Whenever I’m presenting I try to give a presentation. Nobody wants a lecture. Nobody wants a photographer brag about their great pictures. Nobody cares about how hard it was to get that picture. You can tell the story but people want good solid information, and they want to be entertained. They also want to feel like they are a part of it. You have to have confidence and you have to know and feel your audience. That’s a valid point. Going further, you had mentioned just a bit earlier that you had entered an image to a magazine that had been instantly published. Now the market is a bit more competitive. 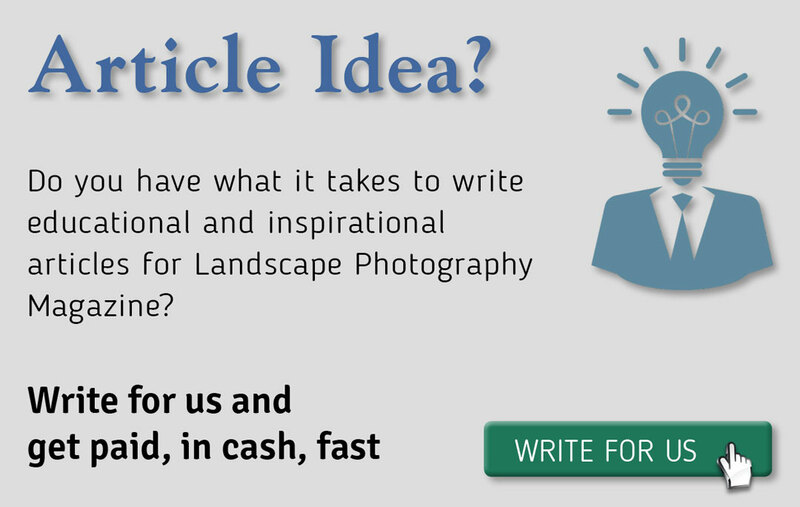 Do you feel that writing increases your changes to be published in a magazine? Here’s the thing. Everyone reading this article knows what I know. Many people lead workshops and many write books. What makes photographers stand out and make people read their book or join their workshop is their personality. I try to make learning fun. I guarantee that you are going to come out with me and you will have a truly great time. My philosophy is that if people are not having fun, then you are doing something wrong. Your personality comes out in your headshot and the pictures you post on social media. Your pictures really do say a lot about you. You are an underwater, landscape, wildlife, travel, and cultural photographer. Is there one genre you enjoy more than others and how have you mastered all of them? I tell people my specialty is not ‘specializing'. I do a little bit of everything. I love wildlife photography and I’m heading to Antarctica at the end of the year. When it comes down to it though, I really do love photographing people. It’s not the aperture, shutter speed or ISO, what it comes down to is getting that person in Cambodia or Nepal to like me or accept me in a matter of seconds and allow me to take their picture. There is an old expression I use a lot, “The camera looks both ways”. In picturing the subject we are also picturing a part of ourselves. This means that the mood, feeling, energy, body language and everything we do is reflected in our subjects. This is what we should be thinking about. Do you feel that it is important to have a personal style and if so, how does that evolve in your opinion? Many people think that one should specialize and have a personal style, but my specialty is not specializing, as I mentioned before. None of my underwater, landscape or HDR pictures have a specific style. There are people who have a style. We mentioned before that if you are good at one thing, you are likely to be good at another. So, if you are good at food photography, you are probably good at flower photography also. If you are good at sports photography, you are probably good at wildlife. My advice is to do as many things as you can so if people want to hire you to do something, you are not locked into one genre. We must thank RRS for sponsoring this interview, getting us in contact with you and allowing us the opportunity to chat with you. Can you tell us what made you decide to make RRS your tripod of choice? Picture this. We are photographing this beautiful black beach in Iceland and we are capturing the water flowing in and out and around pieces of icebergs. This means that you need a really good and sturdy tripod and yet, they show up with cheap, unreliable ones. They see me using the RRS tripod and always ask questions. I know that really good tripods are expensive, but it’s an investment you’ll make one time. I always say that if you buy an RRS tripod, you are never going to have to buy a tripod again. It’s sturdy, steady and the ballhead is the best out there. So folks leave my workshop and they go home and order one. I believe that if you call the group over at RRS they will fit you into the right tripod through a series of questions about you and your photography. Isn’t that right? Today, no matter what company it is, customer service is key. RRS has great customer service. One of my quick releases on the ball head was bent when someone knocked it over. I sent it in, and it came back right away. You have clearly been in the industry for a long time. Can you tell us a few of the things you do to keep you inspired? How do you stay passionate? Many things keep me inspired. I find it very exciting visiting new places. I think it’s the excitement of not knowing what images you are going to get, and then is the thrill of looking at them in Photoshop or Lightroom. That really inspires me. Also, when people thank me for helping them make good pictures, well, I find it really rewarding. Photography gives you a license to do things you wouldn’t normally do. When you visit a village in Papua New Guinea, you are involved in these people's lives. You get to see how other people live and to see what is most important to them. I would think that by taking the time to study and learn the culture of these places that it would also speak into your landscapes when you are capturing the essence of that land. That’s true. Understanding the subject is vital. Also, having a great guide is important, but understanding the subject is important no matter what or where you are. You have achieved so much. I think most people looking at your bio would say “this guy has achieved everything”. Clearly you are still a spring chicken, so what’s your next goal or challenge that you’d like to accomplish? I have written 36 books and I have another one coming out in September called The Evolution Of An Image. In this new book I talk about the importance of a variety of subjects. It’s really a behind the scenes look. To answer your question though, I would love to have a coffee table book on my world pictures but the thing is that it is pretty hard to get a coffee table book today. The market for those types of books is very tight. I do follow my own advice which is never give up, which is why I have 37 books and 13 classes on Kelby Training. I think I give more seminars than anyone else. It’ is very competitive with more photographers almost everywhere and finding unique compositions has become extremely hard. As we always like to offer advice to our readers, what advice would you offer them on this? We run many workshops during the year. We were in Yosemite once and a person wasn’t happy because she wasn’t getting the iconic shot. You know, that’s ok, get the iconic shot, but also try something different. Try a different processing or a different lens. Many people photograph half dome with a wide angle lens. Why not try a telephoto lens, photograph it at night or in the rain, or even make a high contrast print? A couple of decades ago star trail photography looked amazing to many people. It’s not that amazing anymore because it’s not that hard to do. I saw a Miles Davis quote today which also applies to photography. He said “sometimes you have to play a long time to be able to play like yourself”. This could translate to “sometimes you have to copy a lot of pictures before you can start taking pictures for yourself”. There is a great book out called ‘Steal like an artist’ and it was a New York Times best seller. It starts out with a quote from Dhali that I love – “Those who want to imitate nothing, create nothing”. It sounds funny, but it’s true. Once you learn the techniques you can apply them to different types of photography and different compositions. Follow your own heart and learn about composition but then break every rule. Do you have a location you have not been to yet that you would really like to visit and photograph? We are going to the Falkland Islands and South Georgia. The landscapes are spectacular as are the animals. I’d also love to go to Patagonia because I’ve seen some amazing landscapes come from there. I also recently saw someone do trips to Canada and I think I’d like to get up there and do a workshop with this person because I think it would be awesome to see the Canadian Rockies. They are indeed. Is there one common theme you see photography students struggle with and what is your advice to help them overcome that struggle? Any of my fellow workshop instructors would give you exactly the same answer. People don’t know their gear well enough. They can’t find where the self timer on their camera is and so get frustrated. When Carlos Santana and Eric Clapton are on stage, they don’t look at their fingers every second or thinking about what key they are playing in, or how they move the dials, they just do it. That’s what we have to do as photographers and that comes with a lot of practice. You must know your gear. You have mentioned to me in the past that you use plugins for your post processing. Which ones do you use? I enjoy OnOne Software, I love Nik, Topaz, and Topaz Impressions. I think the plugins can help us awake the artist within. Being in the industry for over 40 years, what is the one thing you feel photographers today could learn from those who have gone before us? I would say follow your heart. You can copy all the other stuff and you can listen to all the criticisms, but I would say follow your heart. When you do what you want to do, and you get good at it, the benefits will follow. As my mother once told me when I was young, never give up. It is safe to say that you are viewing the photography industry from the top and when you look at it globally from the top, you get a different perspective when you can see the whole picture. You have the relationships with magazines, brands etc. What do you think is the most important element to being a successful landscape photographer? The most important element is to cut the clutter. We see spectacular scenes and get overwhelmed. We have to realize that throwing on the widest lens isn’t going to tell the story. Looking back at your life, what is one legacy or impression you hope to leave on the industry? I’d love for people to look back and say “this guy had a lot of fun, he made it fun for many people and that I learned from him”. I have a bunch of quotes and I call them Sammonisms. I have already dropped a bunch of them in the interview, but I think my all time favorite quote is “We are a part of everyone we meet”. When you think about this, Tiffany, your personality is developed because you saw things in other people that you liked. So, we really are a part of everyone we meet. If you could leave one piece of advice for our readers what might that be? Go for a walk and not only just to stay healthy. I get so many ideas when I’m out walking because I am not thinking about emails, texting or anything that can distract me. When I walk I can actually think. Tiffany Reed Briley currently lives in Charleston, SC with her husband. They own Charleston Photography Tours and The Photography Workshop Company. Tiffany is on staff at The Landscape Photography Magazine and Wild Planet Photo Magazine. Raised in Alberta, Canada she enjoys photographing the seascapes of Charleston, the majestic vistas of the Canadian Rockies, and is always ready for the next adventure awaiting her.